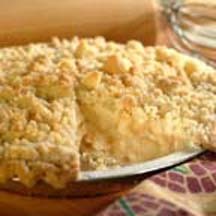 Frozen escalloped apples makes this apple cream pie a cinch to prepare. Mixing marshmallow creme with cream cheese is the secret for its great creamy taste. For Filling: Combine apples, cinnamon, and lemon juice in a medium bowl; stir well, and set aside. Combine marshmallow creme and cream cheese in a small bowl beating at medium speed with an electric mixer until blended. Fold into apple mixture. Spoon into pastry shell. For Streusel: Combine brown sugar and flour in a small bowl; cut in butter until mixture resembles coarse meal. Stir in walnuts. Sprinkle over apple mixture. Bake in a preheated oven at 375°F (190°C) for 30 to 40 minutes. For Drizzle: Combine powdered sugar, water, and vanilla in a small bowl; stir well. Drizzle over warm pie. Serve at room temperature or chilled.